Not everyone likes Field Of Dreams, the 1989 Kevin Costner movie about a man who can summon ghosts and also likes baseball, but that’s partly because not everyone has seen Field Of Dreams. Everyone who has, though, will surely be horrified to learn that some twisted jerk has trashed the actual baseball field built for the movie with their car, causing thousands of dollars of damage and leaving tire treads all over the infield. The field is outside of Dyersville, Iowa, and this news comes from the Dubuque Telegraph Herald (via ESPN). The owner of the Field Of Dreams site, Denise Stillman, said that “someone who is disturbed had some agenda to damage the field,” adding that the extent of the damage won’t be clear until spring when they can really see what needs to be fixed. There are apparently no security cameras on the field, and nobody on staff could identify the car, but that doesn’t mean it’ll be impossible to find the culprit. 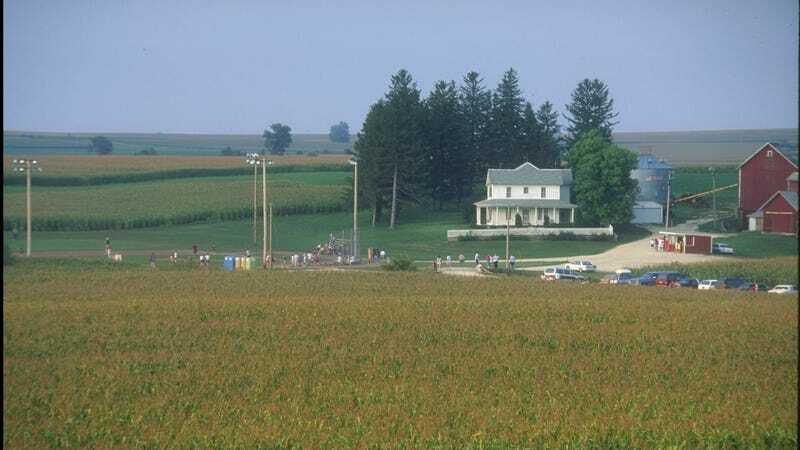 Field Of Dreams is a movie about Kevin Costner reconnecting with his father, and most people with a father will become a blubbering mess by the time Costner is playing catch with his ghost dad at the end. That means whoever did this must either be someone without a father who is jealous of Kevin Costner, or it’s someone who really hates their father and wants to make it impossible to reconnect with his ghost over a game of catch. That seems like a reasonably solid lead, so the Dyersville police should have no problem finding someone who both owns a car and hates their dad’s ghost—as long as Shoeless Joe Jackson doesn’t find them first and get his own supernatural vengeance. For anyone interested in make sure people can still meet the ghosts of their own fathers, Stillman has set up a GoFundMe page to raise the necessary money for the repairs to the field.